The three-star Hotel Le Isole is small, with only 13 rooms (all air-conditioned, with free Wi-Fi). 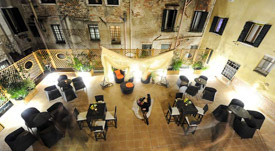 The hotel is located on a quiet little street by a canal, only a short distance from both the Alilaguna airport-boat stop at San Zaccaria and the Piazza San Marco. As you leave the Alilaguna Linea Blu airport-boat station, walk toward the left side of the Hotel Savoia & Jolanda (the rose-colored building straight ahead of you). Walk down the Calle del Vin, past the Hotel Campiello. Turn left at the Ramo del Vin, then turn right onto the Fondamenta del Vin (a street that runs alongside a canal). Continue past the Hotel Doni to the Hotel Le Isole, which is at the end of the short street just before the Campo San Provolo. Take the Alilaguna Blue Line airport boat from the cruise basin to San Zaccaria. Cross the bridge to the vaporetto or waterbus stop, which is just ahead. Take a No. 2 vaporetto in the direction of San Zaccaria. Get off the boat at San Zaccaria, walk toward the Hotel Savoia & Jolanda (the rose-colored building facing the waterbus pier to your left), and follow the directions above.